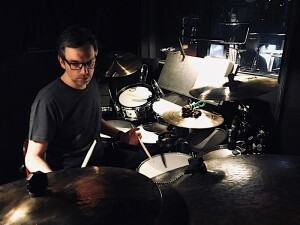 Hidden away in dark rooms under or behind the stage, London’s West End musicians are the unsung heroes of some of the world’s most successful musical theatre shows. 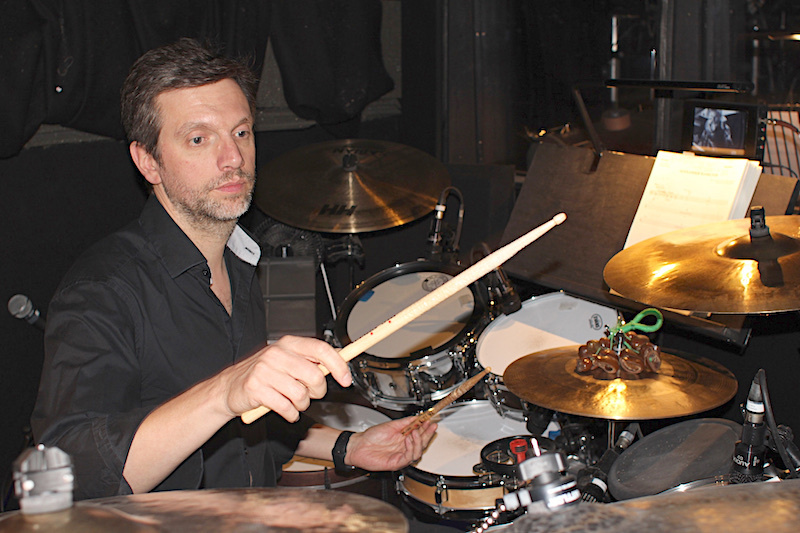 With over 20 years of experience, Tim Goodyer is one of the most in-demand drummers on the scene and has earned his spot as the number one choice for many West End Musical Directors. Over the years, Goodyer has worked on shows like Disney’s Aladdin, The Book Of Mormon, Shrek The Musical, Dirty Dancing, Avenue Q and many more; spanning centuries of musical history and a vast array of genres. I caught up with Tim to chat about his way into the musical theatre world, the challenges of playing multiple West End shows at the same time, and his current show Hamilton. You didn’t go to music college but nevertheless started gigging a lot straight out of school? Yes, well at the time there wasn’t much of a choice to go to college and do drums. There were options of doing classical percussion but I didn’t wanna do that as I was never really good with tuned percussion. It just doesn’t click with me and I didn’t want to go down that route. I think though if I would have gone to music college I would have met a lot more people early on and made some of my mistakes in the relative safety of college, so I do regret it a little bit. Coming out of school I did pretty much whatever I could get. I was doing local amateur dramatics shows, working men’s clubs, pub bands, recording library music for a budget CD company with a friend of mine – literally anything that I could get my hands on. I did that for a couple of years after I left school and it was a really good education in terms of doing a lot of different gigs and playing lots of different styles of music. I think that’s a little difficult now: a lot of that work isn’t there anymore. It’s much harder now to find loads of gigs. There were a lot more music venues, pubs and clubs back then and they all had live bands. Some even had a house band. All this stuff is gone so I think there is a lot less opportunity. Your first professional dip into the musical theatre world was the tour for Joseph and the Amazing Technicolor Dreamcoat, right? Pretty much, yes. I did some pantos and stuff like that before though. I didn’t particularly set out to get into theatre, it was just something I did for money when I was at school because it was local and quite well paid. I mean it was £150 a week which doesn’t seem much now but back then at the age of 18 it was pretty good. One thing led to another and I ended up doing Joseph on a trial basis. I knew the drummer that was booked for it but he was trying to get out of it. I said I’d quite like to do it, they booked me for a six week trial and I did it for about two and a half years. Through that I got to dep in London for Ralph Salmins fairly early on. He was doing Jesus Christ Superstar at the time and I ended up depping for him a lot. That opened up a lot of doors in town and I started depping on a lot of shows. Has doing the Panto somewhat prepared you for the bigger shows? Not really. I suppose it prepared me for playing with some degree of consistency doing the same thing every night but that’s about it. It’s a very different vibe actually. When I started doing professional shows it suddenly all got a bit more pressurised and formal. I think doing the Joseph tour was a big eye opener as far as how to work in theatre. Just in terms of having a much bigger production company watching what was going on all the time and that what you did had much more of an impact on the overall show. You were much more under scrutiny than perhaps you were doing a panto. If something went wrong there were show reports and faxes flying everywhere (this was before emails). It was a good experience though and I’m glad I did it. It taught me a lot about what to expect and what the hierarchy was. You mentioned you did a lot of depping on various Westend shows at the same time. It must be very challenging to have multiple shows at the ready. The first one you do of each show is always very scary. However many new shows you do, that first night is always terrifying. Especially as a dep. Of course you know what you’re playing, musically speaking, but until you actually sit there and play it with the rest of the band, it’s very hard to actually tell what it’s gonna be like. It’s a very high pressure situation and it’s sort of almost a thankless task because it’s never gonna be the same as when the regular drummer plays. Everyone else has been there eight shows a week for weeks, months or years and all they want is an easy life. They just want to come in, do the show and go home without any unnecessary stress. It’s very hard to fit into that. It can get tricky once you get a few shows on the go. I got up to depping on seven shows at one time and that felt like a lot. It really started messing with my head. Just as I felt like I was beginning to burn out, I started to get my own shows, which probably was the perfect time for it. I know guys now though who are working on 10 shows at the same time. It can be done but it’s heavy going! Any favourite shows you worked on? Oh I don’t know. I used to enjoy depping for Ralph because the band consisted of all the top session guys. I was about 25, quite scared and they were all big, old and scary, but it was all good fun and a very steep learning curve! Out of my own shows, I really enjoy doing Hamilton at the moment, and I enjoyed doing The Book of Mormon. I did that for about three years. To be honest though, I kind of find something in all of them that I quite enjoy and I always try to set them up in a way they’re enjoyable for me. I try to make the gear nice, make the sound nice and just make sure I enjoy playing it even if the music isn’t necessarily something I would listen to at home. You can still enjoy a show because you like playing the drums and you work in a nice environment. You just mentioned “something you wouldn’t listen to at home”. Were you ever into musical theatre before you started playing them? [laughs] Hmm… As a kid, I was more into The Police, Genesis, Hendrix, The Who and stuff like that. But no, not really. I listened to some of them in the name of research but I wouldn’t say I ever sat at home listening to shows. I think the majority of people who play in theatre bands probably didn’t set out to do shows. They’re doing it because that’s where the work is. Also because it’s quite a specific skill set and a lot of the people who came up through music college have the ability to read well and follow conductors. That makes them employable in theatre. But yeah, I don’t think a lot of musicians go home and put on the soundtrack to Cats! You’ve done The Book of Mormon for three years. When is that moment where you decide you had enough of a show and want to move on? It depends on the show I think. I’ve tried to be a little bit careful about what I chose to do and what I would move onto. For example The Book of Mormon sold very well (and still does), I have a mortgage to pay and a family to take care of, so before I decide to leave the show, I need to wait till something comes along that I think is pretty dependable. So it’s not just a case of: ‘I’ve had enough of this, I’ll take the next thing that comes along’. I left The Book of Mormon to do Disney’s Aladdin and those two shows were so different from each other. 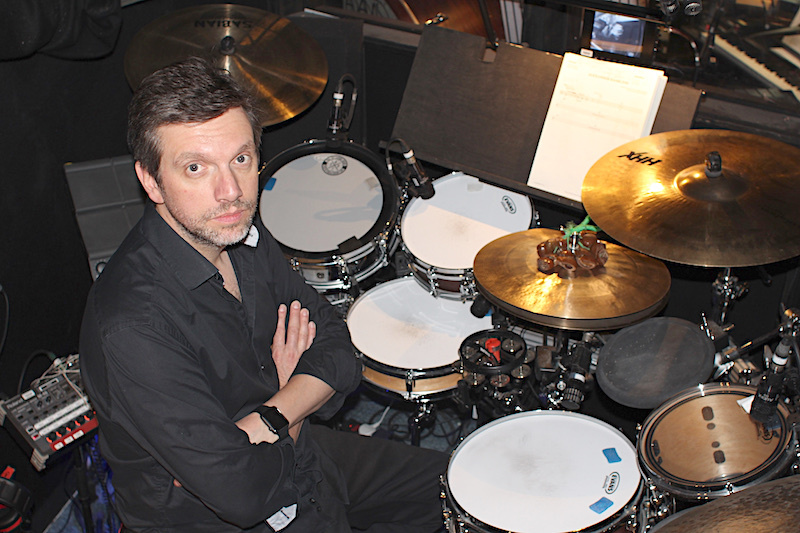 The Book of Mormon is a big smash-about on the drums and it’s quite a leery with a lot of swearing on stage. Aladdin is Disney, so it’s relatively very safe and the music was very traditional show-type stuff; swingy and much more lightweight. It was quite a culture shock but I was pretty tired after three years of playing full out on Mormon, so I quite enjoyed the change. Aladdin had its own challenges: playing with a bigger brass section at lower dynamic levels and so on. I also got out and did quite a lot of other stuff whilst on Aladdin, which helped to keep my other chops up. And then your current show Hamilton came up? Yes, Hamilton actually was an audition process which is very unusual for shows. I got a phone call from the fixer to ask me if I would like to audition and I would have probably said no but I there was such a hype about Hamilton that I got curious. My 15 year old daughter and her friends were really into it too so I thought there must be something in this. I didn’t know anything about it so I downloaded the soundtrack, had a listen and I was actually very surprised about how good and musical it was. Not in a musical kind of way but it almost sounded like a proper album. I just really fancied doing it so I put my neck on the line and here we are. The name to me somehow suggested something more classical. I was very surprised about how modern it is. Yeah, it’s quite full on. It’s a three hour show and it’s completely sung through, so there are no breaks for the band at all. It’s a cross between hip hop, R’n’B, some show-type swingy stuff and the occasional “Purdey-esque” shuffle. But mainly it’s hip hop. I think, in the States certainly, a lot of people actually got into the music before they saw the show and it became a big cult thing over there before it really broke as a show. It got transferred from a tiny theatre onto Broadway quite early on and it just took off. It is still a show and there is no getting away from that but unlike other shows it’s much more contemporary musically which makes it very different to anything else I’ve done. Even your set up is quite different to other shows. 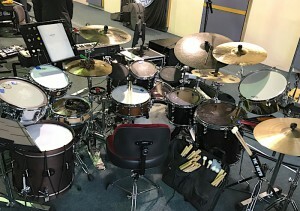 Four snare drums? Five actually! Really, that was all dictated from America. That was the original set up they used. I’ve adapted it a little bit to make myself more comfortable but it’s the same drums (just in a different configuration). They do like a snare drum, it seems! It does sound ridiculous to say, “Yes I have five snares”, but when you hear it in context it really works. I have a main (I guess ‘regular’) snare drum; I have a piccolo snare drum which often has a splash cymbal on it to get that trashy, electronic sound; there is a little Hamilton custom-made signature popcorn snare; a fat snare; and finally there is a custom-made field drum which is like a historic American civil war drum. They do all have their place and it really does make a difference to the feel and sound of the tunes – but it does seem ridiculous when you just casually say you have five snares – I understand that! The snares actually change a lot during tunes as well, so it’s not just one drum per tune. The way the vocals and the band are orchestrated relies on me playing the written part pretty accurately. They’re very closely arranged with a lot of pretty intricate and precise rhythmical things happening where the vocals fit exactly around the drum part. When you listen to it, it might sound like I’m just playing whatever I feel like but actually pretty much every single bar is written out. Every variation in the bass drum and all the ghost notes are in the part. Three hours of reading that is really full on and pretty draining on your brain! Especially two-show days can be really hard. 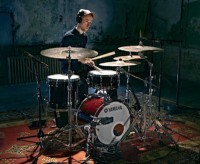 Are you using many electronic drums on it as well then? A little bit but most of the electronics are on the percussion chair. I’ve got a Yamaha DTX Multi12 with two remote pads and a kick drum pedal. It’s a very small amount, maybe about seven patches. The percussionist, Acc Yates, is actually playing like a second drum part most of the time. He uses a Multi12 and a foot pedal, and he also fires off all the Ableton click tracks from there. So he doubles a lot of what I do on electronics. Sometimes I would maybe be playing kick drum and cross stick and he would play electronic hi hats over the top, double the bass drum and play claps on 2 and 4. Out the front you get a big layered sound but in the pit we’re sort of splitting it between us. It’s quite an unusual way of approaching it and can be quite tricky. I try not to listen to much to the percussion because it’s almost like too much information. I just do my thing and I hope that he’s doing his thing. It seems to work! It’s quite unusual for the percussionist to trigger click tracks, isn’t it? That would usually be the musical director’s job. It is interesting yes and it’s a lot of responsibility for that chair holder. Especially when a dep comes in. We actually discovered the other day that one of the percussion notes also triggers the lighting black-out on stage at the end of the first act! Nobody knew this! It’s the last note of the first act and a dep percussion player missed it. That normally wouldn’t have been a big deal but all the lights stayed on and nobody knew what was happening. 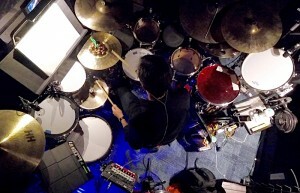 So yes, the percussionist has a lot of responsibility on this show. Reading music is obviously a crucial skill when working in musical theatre. How did you pick that up or practise it? Initially I learned some basics when playing recorder in primary school when I was very little. 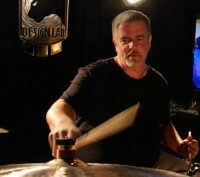 My first drum teacher had been to the military music academy, so I learned traditional grip on a snare drum playing pages and pages of rhythms. I would go to a lesson and just sightread pages of snare drum rhythms; and I actually really enjoyed it. I guess that’s where a lot of it came from. Later I went to have lessons with Lloyd Ryan, who’s a very interesting character! He had a ton of drum music notated (pop tunes, jazz tunes, big band charts and all sorts of stuff) and had the accompanying records for them as well. He had this terrible beaten-up and overly dampened drum kit in a shop in Wandsworth which sounded absolutely horrific! He would sit me down, put the records on, put charts in front of me that I’d never seen and basically roast me for an hour. I was quite scared of him really, which in a way was good because I got all the grilling out of the way early on. When I then got onto a gig, everything else seemed a bit easier. At least there wasn’t a big scary guy shouting at me… well not often! He was very helpful for that because he taught me how to read and interpret drum parts. I later went on to Bob Armstrong to learn about the technical, playing side of things but the reading kit parts is mainly down to having lessons with Lloyd. Generally I also saw reading as a means to an end. I never consciously thought about practising it. It’s like when you’re a kid and learn how to read words, you just sort of pick it up. You mentioned that you learned how to ‘interpret’ charts. That ties in with you once saying you play ‘shapes rather than reading note for note’. Is it important to learn what to play and what to ignore? Yes I think so but I think you just learn that over time, there is no short cut to it. When I say ‘shapes’ I mean that quite often you get a chart that is geographically correct in terms of the structure of the tune, but maybe a piano player has written the drum part and it just looks awkward to play. Maybe they’ve written 8th notes on the snare drum, backbeats on the hi hat and a 4-on-the-floor bass drum. If you played that it, would sound very weird, but you can just look at the shape and you kind of know what they mean. So rather than getting upset about it not being strictly correctly notated, you just get on with it and play what you think is best. Sometimes it’s over-written as well: you can maybe see that half the bar is semi-quavers on the snare drum and then there is a sort of waterfall of notes around the toms, so I’m probably just gonna play the semi-quavers and do what’s appropriate for the rest of the bar. If someone asks me to actually play the fill I’ll just sit down for a minute and learn it. As I mentioned earlier, Hamilton is very much written out and there is not much room for interpretation but for most other gigs or the orchestral work I do, the parts can vary from very good to very weird and everything in between. Thinking that you have to play it exactly as written can make you feel very pressured when actually they just want you to do your thing and make it sound good. You just have to trust your common sense. I guess it is quite tricky for non-drummers to write parts especially as there is no ‘official’ way of writing for drums. Exactly. Most parts are written by non-drummers. They’re done by arrangers who by and large are pianists. I quite often have had arrangers come up to me and ask me about parts they have written. As you said, there is no real standardised way of doing it. Sometimes you can write parts a certain way that’s technically correct, but by just adjusting a few little things it can make a big difference as to how easy it is to sightread. Some people play the same show for years. Can it be dangerous for it to become somewhat of a ‘musicians 9-to-5 job’ after a while? Hmm… it can do I suppose, but I try not to let it. Obviously up to a point you’re doing the same thing every day but that’s the same if you go and do a pop tour. Yes it’s a bit more glamorous with you being on stage and flashing lights everywhere, but you’re still doing the same thing and you’re often still playing the same specific part every night. Whatever you do in music, there’s gonna be a certain amount of repetition. I’ve been on my show for months now and, while I’m not trying to play all eight shows a week, you still play a lot of shows over time. I always try to play well just for the sake of the rest of the band and I believe that’s what the rest of the band do as well. I try to appreciate the fact that I’ve got a gig, that I play the drums for a living and that I don’t have to particularly worry about trying to scrape together a living. I kind of think that deserves a certain amount of respect and diligence from me. With Hamilton I just really enjoy the music. 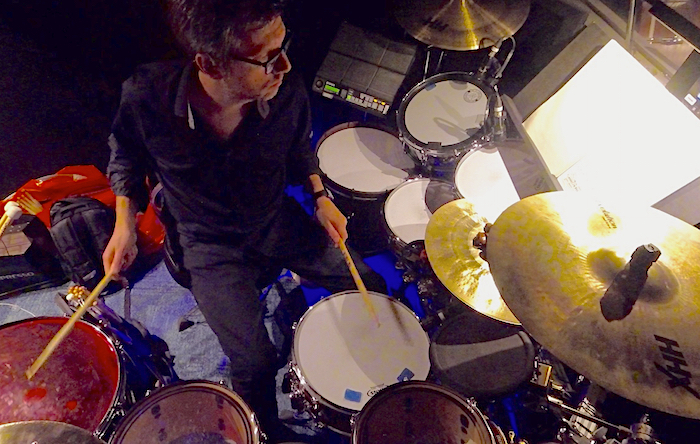 The drum parts are fun and they kind of suit me because they’re the sort of thing I would like to be playing anyway. So yeah, I try to not let it become a 9-to-5. The commuting is the worst bit! Playing a West End show “only” takes up three hours of your day. Do you work on a lot of other things during your time off? It sort of varies. I try to do other work and take as much other stuff on as I can (within reason). 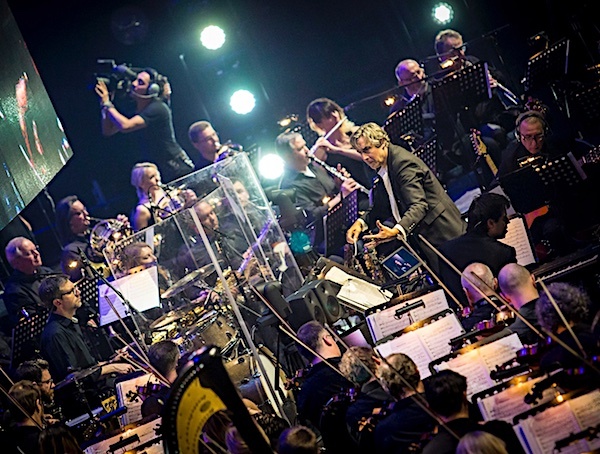 I play a certain amount of orchestral stuff for the Royal Philharmonic Orchestra, Philharmonia and the BBC Orchestra. I’ve also just started to do a little bit of recording at home – mostly for people’s little projects or library tracks. I’m hoping to build that and extend the studio. But I do have to rest a bit as well, to be honest. The show is pretty demanding and on two show days we’re in there for six hours. So Fridays and Sundays – the days after matinee days – I’m actually pretty shattered! I don’t really teach or anything like that, so in my spare time I practise, do a bit of exercise or run around after my children. Plus, although it’s a three hour show, I leave at 5pm and don’t get home until around midnight, so it’s still quite time consuming. You’ve recently done the Roy Orbison hologram tour as well. That must have been interesting. Yeah, that was an interesting experience. Basically, he was projected onto a mesh screen (which you couldn’t see from the audience) at the front of the stage. In order for him to be seen probably without going see-through, we couldn’t have anything behind him and the had to control the lights on stage very carefully. So there was a whole orchestra and a rhythm section on a very dimly-lit stage. It was a weird gig. It was fun to play along with his original vocals. I actually did a little bit of that with Elvis a while ago too. It was very interesting to see the audiences reaction to the hologram. They didn’t really know how to take it. For a start he sort of just materialises out of this hole in the floor which is a bit comedic. You could see people clapping but they seemed to not quite know what to do. It went down really well but the audience just didn’t quite know how to take it. We basically recreated this gig he did called ‘A Black and White Night’ which is quite a classic concert with a lot of celebrity guests. It was about an hour and a quarter long and quite a light play, so compared to Hamilton it was very relaxing. It was a fun tour, I very much enjoyed it and Roy was very well behaved!! Is it fairly easy to go touring if you have a Westend chair or is it a no-go to disappear for (let’s say) two weeks? I don’t normally go away for more than two weeks in a row. It would normally be a few days here and there but they’re usually fine with it. There a certain rules you have to follow: for example there is a certain number of people out of the whole band that are allowed off at once. Same thing goes within the rhythm section. It normally all seems to work out OK. I mean it wouldn’t all fall apart if they had a whole band of deps in but they’re just trying to maintain a certain consistency, I guess. I just think you have to get out regularly. It drives you mad if you do all the shows. I’ve seen people do it and it’s not good for you. That’s how I cope with the repetition: try to get out as much as possible and enjoy the fact that I’m drumming for a living. More Hamilton! I’ve only been there six months and I’m still very much enjoying it. It’s a very good and credible gig so I’m in no particular hurry to leave any time soon. I mean if something else comes along in a year or two, I might think about that but for now I’m happy. Other than that, I just have some other regular things I get out of the show. I’ve got some festivals over the summer with Mari Wilson and I have some things with the Royal Philharmonic Orchestra too. Just whatever comes in really. It tends to be quite last minute stuff. Thanks a lot for your time Tim!